Restaurant.com is the nation’s largest dining deals site, offering more than 62,000 partner restaurants and online providers nationwide. We’re also a marketing program for restaurants and a trusted partner for many businesses and organizations. Our programs are designed to help local communities thrive through a 360-degree approach that benefits diners, restaurants and businesses. Valid for parties of two or more unless otherwise stated. Valid for dine-in only unless otherwise stated. 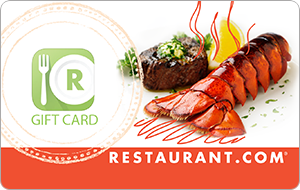 Unredeemed gift certificates not valid toward purchase at restaurants. Limit of one (1) gift certificate per restaurant per visit. There may be minimum spend requirements at participating restaurants and online merchant websites. Visit http://Dine.Restaurant.com for complete terms and conditions and participating restaurants.